The night of January 20th/21st, 2019 marks the only total lunar eclipse visible from the Americas this year – one which also includes Europe and parts of Africa (for those willing to either stay up or get up very early). Dubbed by some a “Super Blood Wolf Moon”, the eclipse is somewhat unique in that it brings together three lunar events. “Super” refers to the fact that the Moon’s orbit around Earth is not circular but an ellipse. It varies from 362,600 km (225,300 mi) to 405,400 km (251,900 mi) on average. This means that at perigee, the Moon can look up to 30% “brighter” than it does at apogee, and is thus a “supermoon”. “Blood” is derived from the fact that during an eclipse, the Earth lies between the Sun and the Moon, and the Earth’s atmosphere naturally absorbs more of the blue and green wavelengths, thus leaving more of the red wavelength to strike the surface of the Moon, giving it a bloody hue. A “wolf moon” refers to the first full Moon of January – which is winter in the northern hemisphere and the time when wolf howls were most often heard in the wild. The entire January 20th/21st eclipse will be visible from start to end from all of both North and South America, and from the UK, Ireland, Portugal, Norway and parts of Sweden and northern Russia. 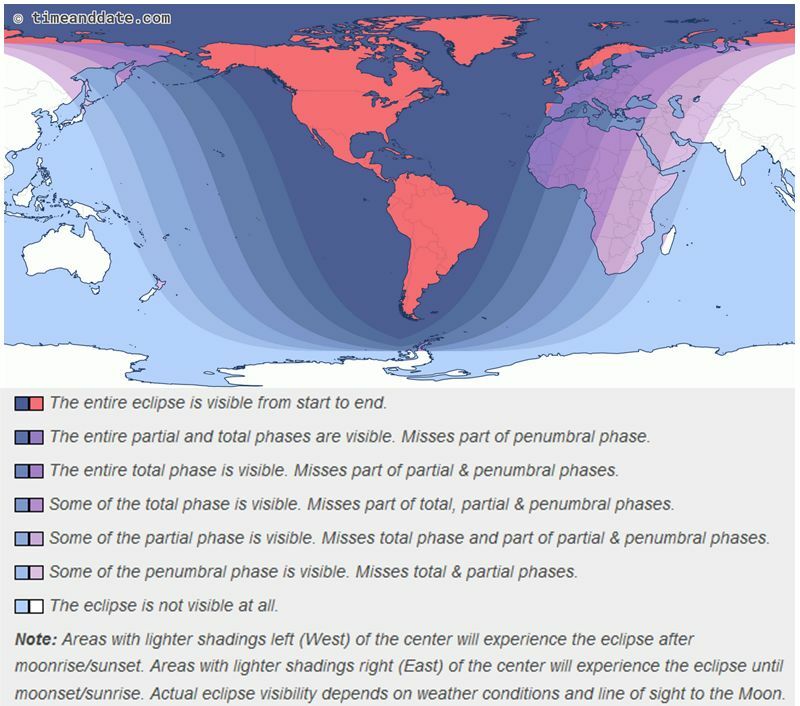 Elsewhere in Europe, the eclipse, including totality – when the Earth’s shadow fully covers the Moon – will be visible across Western Europe, but elements of the entire event – such as of the part of penumbral phase or parts of the partial and total phases. A timetable of the principal points in the eclipse is provided below. Slooh.com starting at 03:30 UTC (22:30 EST / 19:30 PST). Timeanddate.com starting at 03:00 (22:00 EST / 19:00 PST). Griffith Observatory in Los Angeles starting at 04:10 UTC (20:10 EST / 17:10 PST). The Virtual Telescope Project starting at 03:30 UTC (22:30 EST / 19:30 PST). SkySafari 6 (Android and iOS). Stellarium Mobile (Android and iOS). Star Walk 2 (Android, iOS and Windows 10). On January 14th, 2019, the China National Space Administration confirmed that, albeit briefly, there was life on the Moon. Admittedly, the life in question was not alien or natural to the Moon, and had been placed there by the Chinese themselves, but it was still a major milestone in the Chang’e 4 mission and China’s lunar aspirations. At its heart is an experiment referred to at the Lunar Micro Ecosystem (LME). A 2.6 kg (5.7 lb) sealed stainless-steel cylinder containing bioscience test loads, LME designed to test whether Earth plants and organisms can grow in the harsh conditions and reduced gravity on the lunar surface. It includes six types of organisms: cotton seed, potato, rapeseed, Arabidopsis thaliana (a flowering plant), as well as yeast and fruit fly eggs. The unit has environmental systems keep the container hospitable and Earth-like, except for the low Lunar gravity, low temperatures and radiation. It had been hoped that together, the mix of fly eggs and plants would form a simple synergy: the eggs would hatch with the larvae producing carbon dioxide to assist with plant growth, with the plants producing oxygen (and food) for the fly larvae to progress to flies; the yeast would then help with regulating the carbon dioxide and oxygen. This type of research into developing closed ecological systems is seen as a means of helping to develop biological life support systems for long duration space missions in orbit, on the Moon and to other planets. 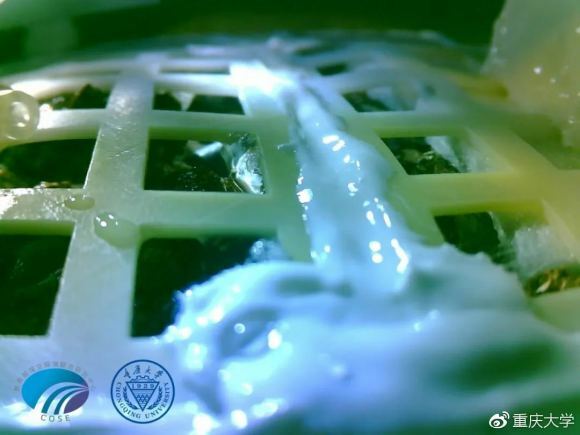 Within a few hours after landing on January 3rd, 2019, the biosphere’s temperature was adjusted to 24°C and the seeds were watered. The cotton seed was the first to sprout, as seen in images recorded on January 7th, 2019, that were included in the report issued by CNSA. It was also indicated that the rapeseed and potato seeds had also sprouted and were growing well as of Saturday, January 12th, although no photos were included in the report. It’s not clear what happened with the other seed or the fruit fly eggs. The celebrations on the success of the project were short-lived however, with the onset of the lunar night. In the region Chang’e 4 occupies on the far side of the Moon, temperatures started to fall rapidly at the end of the two-week lunar day, and as the LME chamber does not have any heating systems, it was reported on January 16th that the sprouts had died due to the cold, and the experiment is now regarded as being “over”. 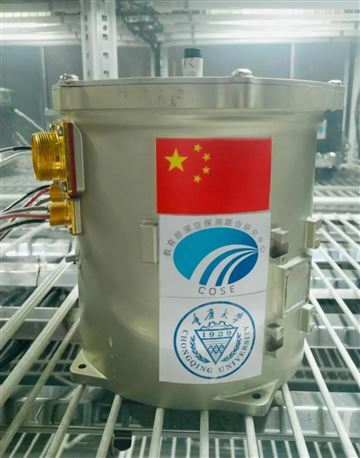 Despite this, the Chinese believe they learned enough from LME to be of use in designing future tests to determine how terrestrial organisms fair in a sealed and pressurized lunar environment. 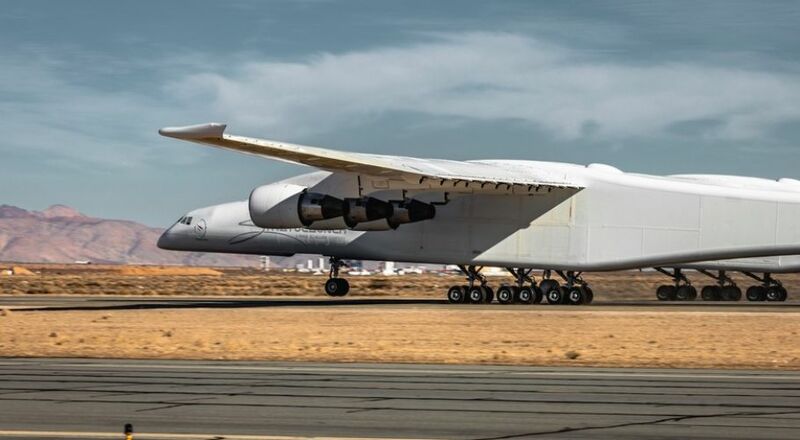 Stratolaunch, the company founded by the late billionaire Paul Allen, has indicated that its massive air launch carrier aircraft is approaching the point where flight tests will begin, and that it has ceased the development of an in-house families of launchers for the vehicle. The Scaled Composites Model 351, dubbed “Roc”, is a six-engined, “twin-hulled” behemoth was rolled-out in March 2017, and in April of that year, Stratolaunch indicated that when fitting-out of the aircraft had been completed, they planned to commence taxi tests prior undertaking the first flight of the aircraft in summer 2018 – but only after the aircraft had achieved a fast taxi test in excess of 200 km/h (125 mph). That target speed was exceeded during a fast taxi run on January 9th, 2019 which included a “rotation authority manoeuvre”. This saw the aircraft’s nose wheels briefly lift clear of the runway in simulation of the rotation manoeuvre seen when an aircraft is actually taking off. No official announcement has been made on when Roc might take to the air, nor any reason for the protracted taxi test run. But with the high-speed run, which reached a speed of 219 km/h (137 mph), has given rise to speculation that the first flight could be in the near future. One reason for the delay in completing the taxi tests might be that Stratolaunch has been unable to determine which launch systems the aircraft will actually carry. In 2011, the company indicated it would use a modified version of SpaceX’s Falcon 9 rocket. A year later, this was abandoned, and the company joined with Orbital Sciences (now Orbital ATK) and Northrop Grumman, with the intention to use a solid fuelled launcher called Thunderbolt. Then in 2016, Stratolaunch stated that route would not be pursued, and instead, Northrup Grumman’s tried and proven Pegasus XL launcher would be used. The Roc being able to carry up to three of the rockets per flight. Then, in August 2018, the company indicated that as well as the Pegasus XL, they would develop a “family” of in-house payload vehicles for use with Roc, starting with a “Medium Launch Vehicle” or MLV, capable of placing 3.4 tonnes in low Earth orbit (LEO), starting in 2022. It would be followed by the MLV-Heavy, utilising an additional stage of strap-on engines and capable of placing 6 tonnes on LEO. At the time of that announcement, Stratolaunch indicated that development work on the MLV had started, and initial design work on MLV-Heavy had started. Further, Stratolaunch indicated they had started studies into a reusable spaceplane style of launcher, initially for cargo flights, but graduating to crew flights. 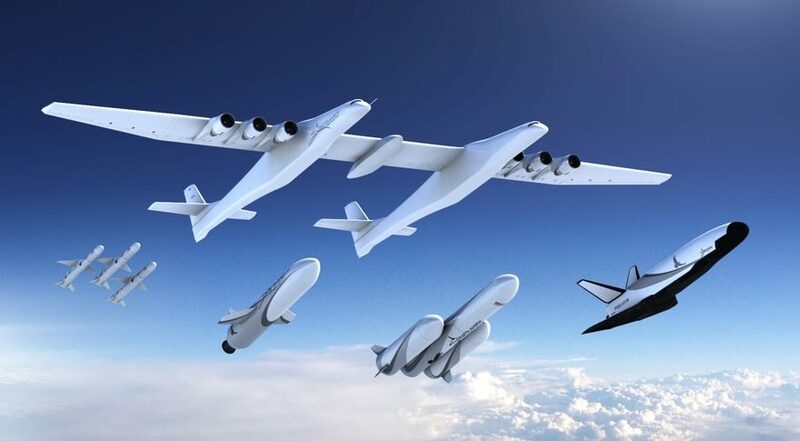 It is possible that the programme to develop dedicated launch systems may have caused Stratolaunch to pursue a less aggressive flight development programme for the carrier aircraft. However, on January 18th, 2019, the company indicated all work on the “home-grown” launch vehicles would be discontinued. Instead, they will focus solely on launching the Pegasus XL carrier. Again, no reason for the shift in emphasis has been given, or the impact on the company’s workforce. One possible reason for the shift might be the passing of Paul Allen himself in October 2018. Stratolaunch has been entirely funded by him through his holding company, Vulcan Inc. While the latter has indicated funding on all of Mr. Allen’s projects would continue, no specific details have been revealed. But the fact is, Stratolaunch could be facing odds it cannot overcome. Virgin Orbit are not far from commencing test flights with their own airborne launch system; SpaceX has proven its ability to handle multiple (constellation) style launches of satellites, and other low-cost players are entering the market. As such, there is a risk Stratolaunch – even with the boast of being able to launch up to three payloads per flight, each to a different orbital planes – might find gaining a foothold in the market difficult. Red Dwarf Explanets: Life or Not? Because of Barnard’s Star low mass and brightness, the planet only receives about 2% of the energy that the Earth receives from the Sun. This puts it at, or beyond the star’s frost line, where volatile compounds like water, carbon dioxide, ammonia and methane condense into solid ice. As a result, the planet likely has a surface temperature in the region of -170oC, making it inhospitable to life as we know it – although if the planet has an atmosphere, its surface temperature could be higher. However, a new study suggests Barnard’s Star b might be capable of support life; just not on its surface. By analysing 15 years worth of high-precision photometry of Barnard’s Star and combines it with newly acquired data, it suggests that if the planet has a hot iron/nickel core and experiences enhanced geothermal activity, it could well support life subterranean life. Such geothermal activity would be enough to generate heat and energy to support sub-surface micro organisms whilst still leaving the surface icy cold. Geothermal heating could support “life zones” under its surface, akin to subsurface lakes found in Antarctica. We note that the surface temperature on Jupiter’s icy moon Europa is similar to Barnard b but, because of tidal heating, Europa probably has liquid oceans under its icy surface. This doesn’t mean there is life on Barnard’s Star, but it might increase the potential for life being there and possibly on other, similar exoplanets. Barnard’s Star is a red dwarf M-class star. These are, as I’ve mentioned in the past, the most populous class of star in the Galaxy, and the type frequently has planets in orbit. However, the chances of these planets harbouring life as we might recognise it on their surfaces was dealt a further blow in another report. In short, it demonstrates that planets around M-type stars may not get enough radiation from their stars for photosynthesis to occur. To explain: life on Earth today requires a nitrogen and oxygen gas. However, 4.1 to 3.7 billion years ago, when life first arose, the atmosphere was largely carbon dioxide and methane and hostile to present-day life. It took the arrival of photosynthetic organisms to convert it, around 2.7 to 2.3 billion years ago, to produce an atmosphere in which life could thrive. Photosynthesis obviously relies on sunlight, specifically a range of UV light – around between 400 to 750 nm. The new study suggests that when all factors are taken into account, low-mass M-type stars would be unable to exceed the minimum UV flux required to create a biosphere similar to that of Earth. This implies that the habitable planets discovered over the past few years around the nearby dwarf stars, Proxima Centauri (nearest star to the Sun, 4 light years away, 0.12 solar masses, with one habitable planet, Proxima b) and TRAPPIST-1 (40 light years away, 0.09 solar masses, with three habitable planets TRAPPIST-1e,f,g), probably do not have an Earth-like biosphere. More generally, the spectroscopic studies of the composition of the atmospheres of planets that transit their stars (like TRAPPIST-1) are unlikely to find biomarkers, such as oxygen or ozone, at detectable levels. If oxygen is found, its origin is likely to be non-biological. 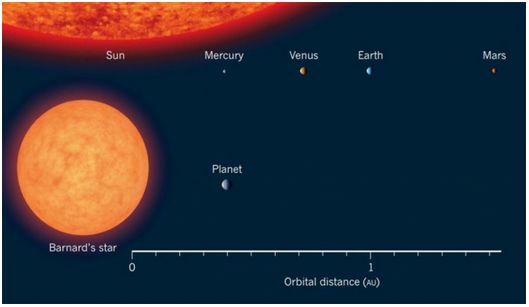 The study isn’t conclusive, but combined with the often unstable and violent nature of M-class stars, it tends to lend more weight to exoplanets orbiting these stars most likely not being amenable to life on their surfaces as might have been hoped. Out of curiosity: Where did you get the “30%” figure? A 1% difference in distance results in a 1% difference in perceived size. I didn’t memorize exact figures, but I DID remember that the supermoon effect isn’t visible by bare eye alone. What I find much more impressive is earth shine 🙂 Or tides for that matter. Oops… error on my part and missed in reading back that should have been “brighter” at perigee not bigger; the size differential is about 14-16%. Corrected! Overall, the differences in effect between a perigean Moon and an apogean Moon on the tides are regarded as relatively small (varies between 5-6cm and around 12-15cm on average). Oops on my side too 🙂 I misread the numbers as1% distance variation, hence the miscalculation of “1%” size variation. And the “not noticable” part was simply wrong memory apparently (unlike 1%, more than 10% and around 30% in brightness should be noticable enough, albeit just barely without direct comparison). I’m going on the generally accepted figures, as I’m not a Moon observer myself 🙂 . The range of brightness tends to be given as “25%-30%” which is why I went for “up to 30%”, being the high end of the scale. Similarly, the range of apogee and perigee distances are the averaged-out distances – the Moon can actually get a little closer (and a little further) at perigee / apogee, which may be reflected in the upper range of the brightness average.